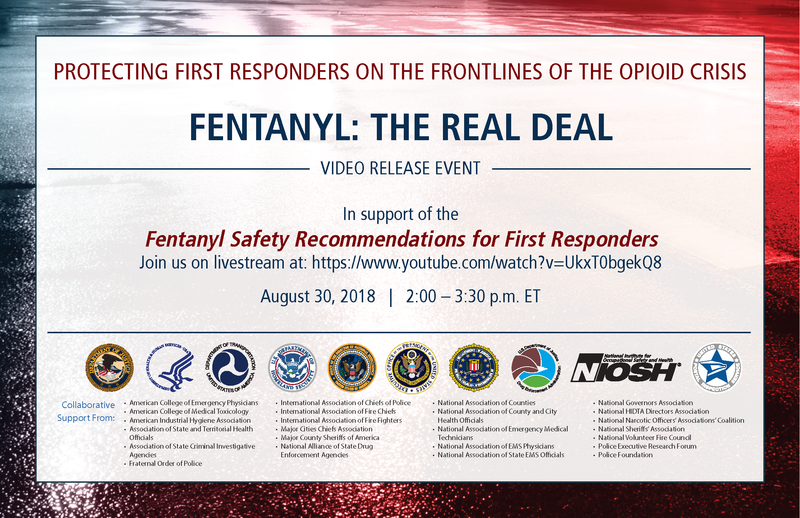 On August 30, 2018, the Department of Justice, in partnership with nine additional Federal departments/agencies and 24 stakeholder associations/organizations, will host a press event to release Fentanyl: The Real Deal. The video, designed for roll call training, reinforces key messages from the Fentanyl Safety Recommendations for First Responders released in November 2017. America’s first responders – including law enforcement officers, firefighters, and emergency medical services (EMS) providers – are increasingly likely to encounter fentanyl and other synthetic opioids during the course of their daily activities, such as responding to overdose calls and conducting traffic stops, arrests, and searches. Sheriffs and uniformed deputies are encouraged to attend. The event is being held at DOJ’s Bureau of Justice Assistance, located at 810 Seventh Street, NW Washington, DC 20531. If you would like to attend, you must RSVP at this link: https://registration.iir.com/COAP/7679.